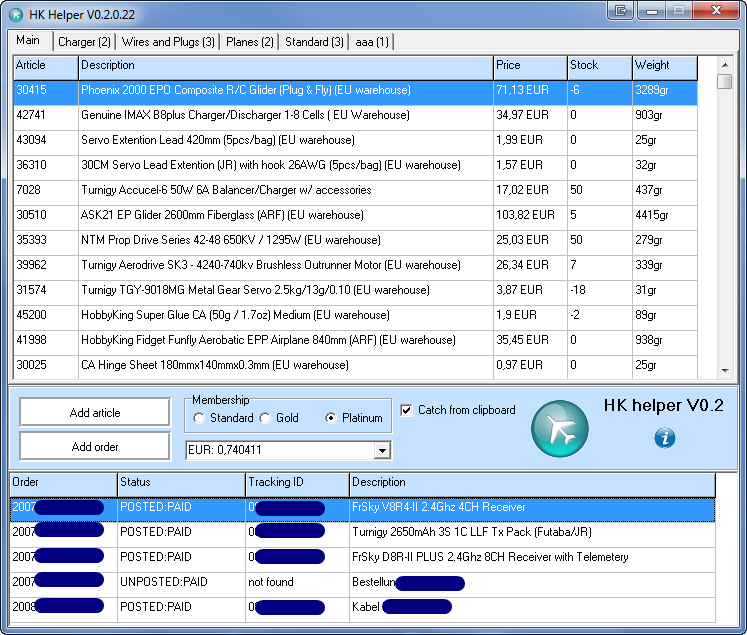 Just add articles and orders by a click on the buttons on the right and see what HK is giving for informations. click on "Add article" inside HKHelper and click "Add article from Clipboard URL". and automatically adds it to your HKHelper list. If you doubleclick an article the corresponding HK page is opened in your web browser using the article number. A doubleclick on an order opens the DHL tracking website. A right click on the article or order list will open these and other actions. The membership selection will change the prices. So check wihich HK membership you have to get the correct pricing. exchange rates HK calculates and also not to the exchange rates Payp*l calculates.!!!! It's just an approximate price.